Design West Landscaping can create exquisitely designed and professionally installed outdoor living amenities for homeowners in the East Bay Area. Our clients are always guaranteed of outstanding features because of our decades of experience in the industry, highly skilled people, creative designers, and partnership with leading material suppliers. With these capabilities, we can handle simple to complex outdoor improvement projects and guarantee fast project completion. If you want to improve the look and functionality of your outdoor space, we are the company to hire. Call or visit us today so we can show you our portfolio of completed projects. Some of our gorgeously built outdoor living spaces are located in San Joaquin Valley and nearby areas. Call (209) 327-9661 now, and we'll give you the specific locations of our completed outdoor features and amenities. At Design West Landscaping, we have creative designers and experienced installation crews who will work together to create the kind of outdoor amenity that you desire. We will also collaborate with you to ensure that all your needs and personal preferences are incorporated in the design proposal. Don't worry if you have a limited budget since we can always find a solution that will help you realize your dream outdoor living amenity. Patios. Most of our previous clients prefer a patio because of the additional outdoor living space that it creates. Aside from the new functional space, a patio can also improve the aesthetic appeal of the entire property. And if you hire us for this kind of project, we will create a unique design that will make your property stand out. 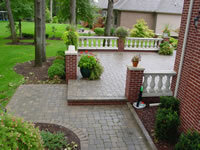 We will also select the best paver design that will suit your home's architecture or landscape’s overall theme. Outdoor kitchens. If you love to dine alfresco style, then an outdoor kitchen is your best pick. We offer custom kitchens complete with your desired features and amenities. We will include grills, ovens, rotisseries, and outdoor appliances. Other great additions to your outdoor kitchen include a dining set, an entertainment system, and a mini bar. Pool decks. 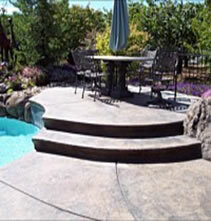 We can make your pool area more functional and attractive by installing a paver pool deck. We only use slip-resistant pavers to improve safety in the area. We also recommend other add-ons, such as pergolas, lounge chairs, outdoor umbrellas, grills, fire features, and other types of shade structures, to make your outdoor stay more comfortable and fun. Gazebos and pergolas. These shade structures are perfect additions if you want wood elements in the landscape. They can be great outdoor living spaces when designed and installed by professionals like us at Design West Landscaping. We can even make these features become focal spots by installing them in the right locations. You can only have the best outdoor living experience if all your outdoor features and amenities were built by expert people. When you hire Design West Landscaping, rest assured that we will create the finest features and amenities in your outdoors. Call us at (209) 327-9661 and let's start discussing your plans and ideas.